I'm not drunk, and this is not one of those "really great ideas" you think of after downing a few cold ones with your friends. This is an article representing what I believe to be a significantly undervalued beverage company that is gearing itself up for a continued stretch of profitability and continuous growth. 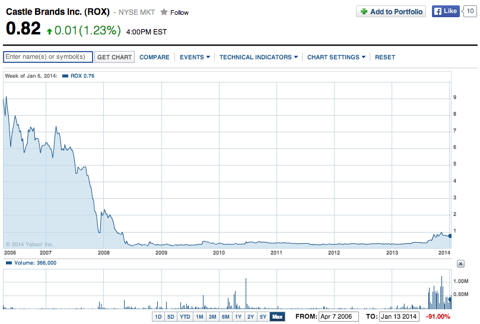 When I first highlighted Castle Brands (ROX), I did so solely because of the fact that respected billionaire Phillip Frost was purchasing shares of the company (and is also on the board of directors). I opened a position immediately, and since then shares have more than doubled, and at its peak more than tripled. After doing a little more digging, Castle Brands turned out to be a fundamentally solid beverage company that is experiencing impressive growth and markets a number of premium alcoholic beverages, including the ever so tasty Gosling's Rum. Shares are trading 30% below their recent high of $1.10, and the stock has moved sideways ever since. A strong two-month period of consolidation has allowed the stock to develop strong support at $0.71, bouncing off of this level a number of times intraday. The most recent quarterly earnings release was a testament to the fact that Castle Brands is on the verge of recording positive net income for the first time in its existence. 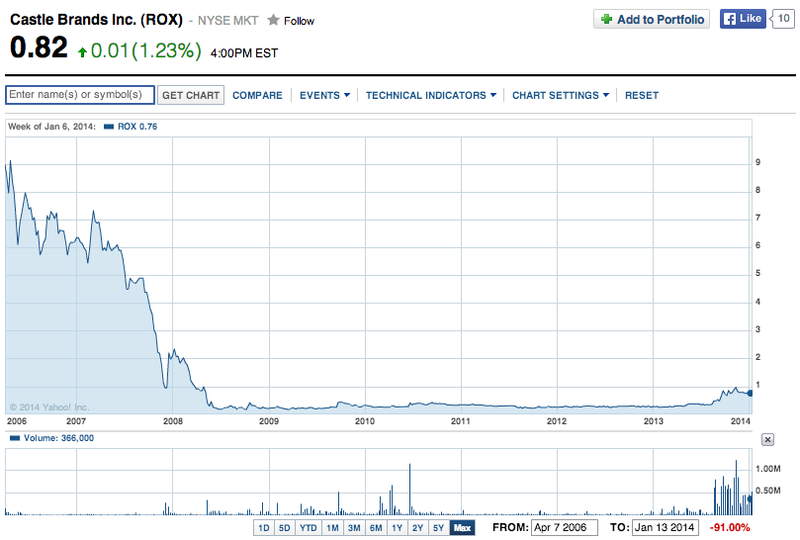 The stock has been battered ever since it went public in 2006, shedding more than 90% of its value. Castle Brands is a turnaround story in the making, and the company is extremely close to experiencing a breakout success (think Jameson status) for one of its brands thanks to its diverse offering of premium select liquors. Gosling's Rum and Gosling's Dark N' Stormy may very well be the next breakout drink for the beverage industry, and one highly successful (and expensive) marketing campaign is all Castle Brands needs to slingshot this already popular brand into the mainstream. The 2Q 2014 earnings released on November 11th served as the catalyst that moved shares above a dollar for the first time in more than four years, and for good reason. The company increased revenues, increased profits, continued to cut losses, and for the first time in its history, Castle Brands recorded a positive quarterly EBITDA of $0.1 million, compared to a loss of the same amount a year prior. 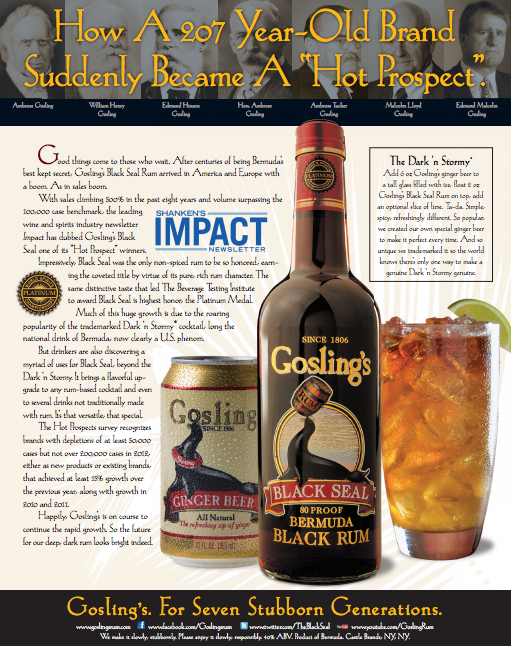 Gosling's Black Seal Rum was named a "Hot Prospect" by Impact, and Gosling's Ginger Beer case sales increased nearly 50% when compared to the prior-year period. 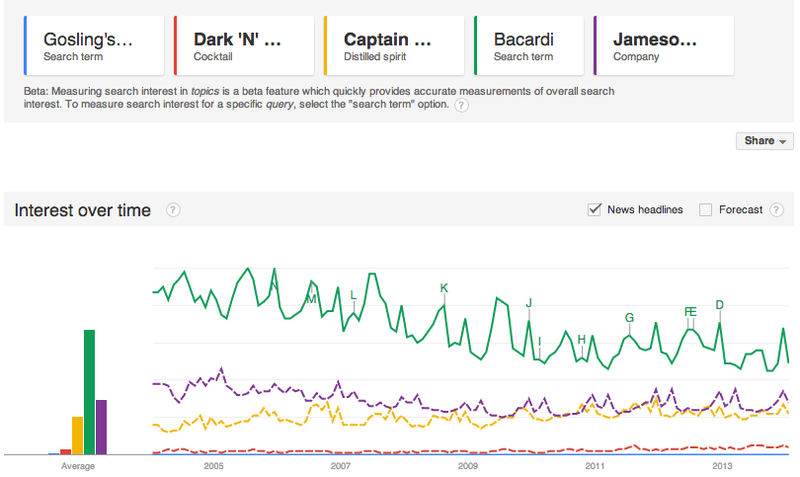 This bodes well for Castle Brands, as they see their signature 'Dark N Stormy' cocktail, a mixture of Gosling's Rum and Gosling's Ginger Beer, increase in popularity, which in effect drives growth for both products. Impact is a highly regarded wine and spirits industry newsletter, and the "Hot Prospect" list refers to the U.S. market's most promising wine and spirit growth brands. To qualify for the award, the winner must post annual sales of at least 50,000 cases, and no more than 200,000. Furthermore, the winner needs to have grown the case sales by at least 15% the year prior, and have had consistent positive growth for the two years prior to that. Sales of Gosling's Rum have climbed more than 500% in the past eight years, and once sales break the 200,000 cases mark, the company enters the territory of "Hot Brand." Gosling's Black Seal Rum was the only non-spiced rum to be honored the "Hot Prospect" designation, and The Beverage Testing Institute recently awarded the rum the Platinum Medal, its highest honor. This rum deserves it. I hope this does not come off as an advertisement, but Gosling's Dark Rum is like no other. After stumbling upon the bottle at my local liquor store, and knowing I owned a tiny sliver of this publicly traded company, I felt compelled to try it. It's delicious. After visiting 15 different liquor stores, in Ithaca, NY and Westchester, NY, I saw Gosling's Rum for sale in 73% of them. Furthermore, three store managers claimed the drink was a consistent seller, and of the stores that carried Gosling's Rum, 45% of them had a limited number of bottles available on the shelf. Please keep in mind this was an extremely small sample size, varies per region, and was merely used to gauge the level of presence of Gosling's Rum. Another impressive Castle Brands drink that is showing impressive growth is Jefferson's Bourbon, which led to a 27.8% increase in whiskey revenues from the prior-year period. The success of Jefferson's brand was so strong that Castle Brands was forced to obtain more capital in the form of convertible notes in order to fund and sustain the continued growth. Aged bulk bourbon, raw materials, and finished goods inventory were purchased with the more than $3 million generated in the debt offering. Purchasers of the debt, offered in October of 2013, included Dr. Phillip Frost, Chairman of the board Mark Andrews, and several other insiders of the company. Given the fact that several insiders recently purchased shares in the open market at approximately $0.75, I believe its safe to say that management has a strong outlook for the future of this company. Castle Brands knows what it takes to market a successful drink, just ask Sergio Zyman, Chief Marketing Officer of the company. Sergio Zyman was the mastermind behind the successful launch of Diet Coke, and the not so successful launch of New Coke. Regardless of Zyman's major flop, he has the ability and the know how to make any beverage a sought out drink by the masses, and there's no reason why he can't do that with Castle Brands' offerings. Sergio Zyman seems to be back at his old roots, marketing for a beverage company, and if Zyman's past success is any indication, Gosling's Rum could be gearing up for a steep climb. The brand awareness of Gosling's Rum has improved since I first visited the company's website, Facebook page, and Twitter account a few months ago. Customer engagement is up, along with followers, likes, and comments, and a revamped website makes it extremely easy and compelling to explore Gosling's offerings. However, there is still plenty of room for growth, and the brand awareness looks pitiful when compared to some of the industry titans. This chart should not be critical of Gosling's deflated level of interest, it should merely highlight that Gosling's Rum, and Castle Brands for that matter, both have ample room for growth. At these levels, the company is sitting on the ground and any spark in marketing can inflate the popularity and sales of Castle's offerings. The Bermuda based Gosling's Rum brand recently breached annual case sales of 100,000 in 2012, which is a key level to break before serious growth can occur. Gosling's Black Seal Rum did not become an available option for US consumers up until 2005, when Bermuda based Gosling Brothers Ltd. teamed up with Castle Brands and entered the global rum market. Here are some interesting statements made by Malcom Gosling, 7th generation President of Gosling Brothers, on the decision to go global with his families Gosling's Rum brand, sourced from this 2005 article published by The Royal Gazette, a Bermuda based newspaper. There has been a tremendous amount of focus on the aged rum and premium rum category. Before rum was seen as a second class spirit almost- it just wasn't a refined spirit in a lot of consumer's minds- but now it has been getting a lot of attention because a lot of the global companies are snapping up these distilleries and they are putting serious marketing efforts behind it so, it is bringing rum to the forefront. We want to be a mainstay of the rum category. That is what our goal is. The vodka category has gotten so massive. It is just entry after entry and the consumer is confused and so what happens is that people fall back to the old mainstays (Smirnoff, Absolute) that were there in the beginning before all the new product introductions. The mainstays are now coming back to the forefront and that is our strategy with rum because when rum as a category grows, there is going to be a tremendous number of entries, new brands just created will go in and try to capture some of these sales by the bigger companies so we need to make sure that we have a firm base now. Our plan is to manage it and keep a focus and keep the brand image consistent from market to market and gradually we will be adding countries on. We have tremendous interest coming from Germany, France and Ireland and so these will probably be the next steps for us to hit those markets. Once you are up over 100,000 cases in the US you are truly considered a national brand and then it gets much easier to grow after that point because you have serious recognition to fall back on. When the category starts to get crowded, people are going to get confused over which brand they like or want to drink on a regular basis, and not only that, but there will be so many that not every bar can carry them all. If you choose to drink this obscure brand, then chances are you won't be able to drink it at many places because they have to carry the mainstays so, that is what we want to be. We want to be a mainstay in the rum category. The article does a good job at laying out the vision of Malcom Gosling's rum brand, and describing his strategy for the product. Gosling's Rum tallied more than 100,000 cases sold in the US in 2012, and Gosling's Ginger Beer recently recorded more than 100,000 cases sold in 2013. These developments bode well for the growing momentum of Gosling's Rum and the Dark 'N' Stormy cocktail. The overall beverage industry that Castle Brands is competing in seems ripe for consolidation, which is a positive for Castle Brands and their impressive growth rates among a diverse number of spirits. Castle Brands may very well be acquired in the future, and their wide variety of alcoholic brands would serve as an appealing platform for added growth to any already established beverage company. Suntory's recent acquisition of Jim Beam represents one of the last major targets for takeover in the liquor industry (Bacardi and Campari may be the last major takeover targets), and now large companies are going to have to begin exploring smaller distillery groups and build out their growth organically. In a recent article posted in the New York Times Dealbook blog, several analysts commented on the acquisition of Jim Beam and made encouraging statements for smaller scaled distillery groups. I think there will definitely be further consolidation in the industry, both in the U.S. and globally. Castle Brands' 5 year CAGR is nearly triple the industry average, and its 3-year revenue growth stands at 13%, compared to the dismal industry average of negative 9%. While the company just posted a positive EBITDA for the first time, it should be noted that a positive net income is not far off either. The company's recent quarterly non-cash charge of nearly $4.2 million related to the conversion of warrants issued back in 2011 impeded on the company's profitability potential significantly, posting a total net loss of $4.6 million. The company recently announced that they are converting the rest of the 2011 issued warrants, due to the price action of shares and anti-dilution provisions. This should be represented in the form of one last non-cash charge relating to these warrants. With these charges out of the way after next quarter, it seems positive net income should follow shortly after, if not in the same quarter depending on the size of the charge. Utilizing the industry average price to sales ratio of 3.9, shares of Castle Brands are worth approximately $1.75. At a simple 2X revenue multiple, shares would be worth nearly $1.00. Utilizing an average sales ratio between the two, which I believe is warranted due to Castle Brands' above average growth rates and imminent profitability, shares should be trading at nearly $1.34. These three target prices would represent respective gains of 116%, 15%, and 65% from today's closing price of $0.81. 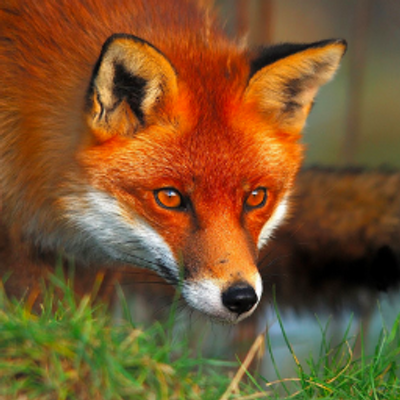 Castle Brands is a growing small cap stock that carries all the associated risks of small cap stocks. Volatility is high, liquidity is low, and total shares outstanding exceed 100 million. Furthermore, the company has never experienced a positive net income, they have an accumulated deficit of $136 million, and the need for additional funds to finance the company's strong growth is a certainty, which would result in further dilution of shareholders, or in the form of more debt. The recent debt offering this past quarter suggests that the company will not need to raise additional funds immediately, but their low cash position suggests that a financing round is around the corner. Technically speaking, Castle Brands has experienced solid consolidation since reaching its 52-week high two months ago, but any close below strong support $0.70 would signal further depreciation of share price. Speculative investors who want to open a position in Castle Brands but don't have a large stomach for risk should set a stop loss around $0.69. 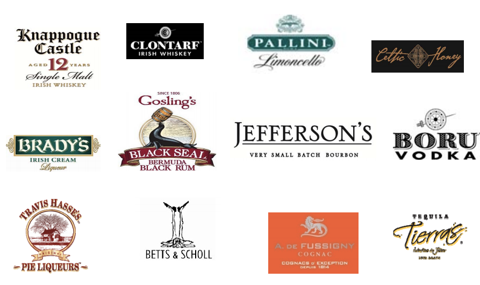 Castle Brands has a diverse portfolio of premium liquors that are growing at an above average rate. The company's strong performance from Gosling's Rum and its whiskey brands bode well for the future of this company, and the possibility of becoming a potential takeover target down the line seems more than likely. With impending profitability around the corner, and a non-cash charge that muddied the company's financial statements last quarter, it seems like now is a good time to open a position in this liquor company and ride its consistent growth wave, before a quarter of strong profitability is posted, rather than after. No Comment to " Castle Brands: Overserved And Buying More "